We’re beginning to wrap things up this week by finishing the last remaining items on our roadmap of things to make it into the final major update. The obituary is done, the veterans’ hall is now fully working, and we’ve added a whole bunch of smaller features. If all goes according to plan, you can expect the update to hit the beta branch of the game later in February. Let’s take a look at shiny new things! 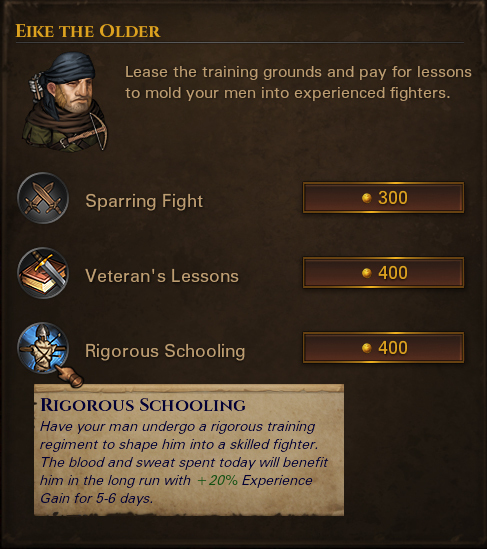 Formerly known as the Veterans’ Hall, the Training Hall is now working fully in the game. 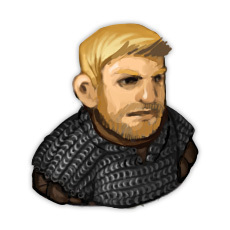 Usually to be found at larger cities and castles, you can pay to have your men trained in various ways here to shape them into hardened mercenaries – especially useful for mercenary companies later in the game that take on new blood. Also known as the memorial wall or graveyard, the obituary is a new screen that lists all of the men that have fallen under your command so you can properly honor their sacrifice. Aside from being reminded of their achievements and time with you, you’ll also get an unnecessarily colorful description of how they died in a column of its own. Old dogs can in fact learn new tricks, as your men are now able to attain levels beyond the 11th character level. Any such level is considered a ‘veteran level’ and, for balance reasons, comes without a perk point and with limited attribute gain, but it does allow anyone living long enough to truly reach their potential, for you to continue to experience the leveling progression also in the very very late game. Another new feature is the ability to attack anyone on the worldmap, no matter your relations, when turning your friendly glove mouse cursor into a threatening sword cursor by holding the Ctrl key and left-clicking them. This only works when you’re striking out on your own and are not currently employed, but it does allow you to go the route of banditry and make lots of enemies if you truly want to, without having to first annoy your employers enough to finally declare you hostile. 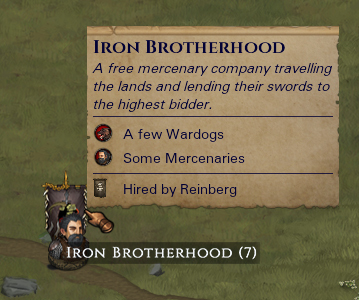 Although there won’t be any new gameplay aspects to support banditry for now, there’s a new deterrent coming: competing mercenary companies that can also get hired by your enemies to hunt you down. The coming update will add around a dozen new contracts to the game, and several dozen new events. We’re still busy writing more of them – more interaction with your mercenaries, new encounters as one of the late game crises ravage the land, and some hidden stuff to discover. We’re also creating new illustrations to go with these. Have a look! Sounds great! Can’t wait to play. “Veteran level”! Holly axe, they heard us … not exactly what we would like, (see the suggestion topic ) but it’s certainly better than the level cap to 11, thank you. The rest of the features – are all a big plus. This is great stuff. Sadly it doesnt look like we are getting unique tactical maps, I think until we do Battle Brothers will sadly feel incomplete. i am very interested too… if we will get tactical map enviroment… like tombstones and stuff. Its nice that you can see the fallen battle brothers but i would recommend expanding the variations of names then. – training regimen – not regiment. In the Obituary can we have mentioned not only number of days merc was in the company, but the day the death occured? This way the Obituary will become not only a personal record for mercs, but a log of the past battles of sorts. That one battle against vampires where all the archers were lost, old and young alike? Yeah, that was a sad day № ##, it will be remembered and told in stories to honour thier deaths and to learn on past mistakes..
About the obituary, it’s really cool to have such thing. The statistics screen after combat now has tooltips with more details for all characters, both living and dead. I’ve been reading your updates hoping you guys mention modding, again. Please don’t don’t forget about modding before you wrap it up. Initially, you seemed very open to this. Which convinced me to support you. Modding will definitely enable you to indefinitely expand the game (perhaps even to future versions). Wow, this looks so great! Well done devs! A couple of additional character details I’d like to see are: (1) the “Change Name and Title” interface for each character changed into “Update Bio, Name and Title” and including a section for you to fill in biographical details of their mercenary careers, and (2) hovering the cursor over (or clicking on) each name on the obituary brings up the relevant biographical details. I think I could put at least 1 point on every 2 or 3 levels of “veteran”. The longer on the path of struggle, the more powerful and knowledgeable in techniques a man becomes (Jigoro and Musashi for example). I still feel bad about the negotiation idea they posted earlier. How about using the prestige points to increase the price significantly? Like, “paying” with a certain amount of points. just what a game like BB was missing, the obituary lol. These features look really rad, but lack of environments is a bit of a surprise. The updates sound good and all but quite disappointed there are no mentions about more interesting battlefields. When a battle is engaged on top of towns/cities etc, or in ruins, why are we always fighting on default outdoor fields? I saw that earlier screenies of this game had buildings and bridges on battlefield and stuff, come on man. Be more creative with the battlefield terrains. Your game is really nice, do you plan other improvments in the future (after your roadmap) ? It’d be better if the map was bigger / or, if there were multiple isles generated, like in a sandbox game. Because once we have explored all the map, there is no exciting challenge remaining. Having multiple isles could allow to manage the level of difficulty between them, like in Heroes of Might of Magic. It also introduce the resources management, we could imagine that such isles are wild and there is no towns or villages. Not necessary an isle : a large wild land with ennemies and other stuff could be very nice. About new feature “attack anyone you want”. I think that now there is not so much of life is going on on the roads. Like, there are only four type of possible travelers – Trade caravans, Supply caravans, Armed patrols and traveling peasants. New update will add other Mercenaries. But still there should be more to make roads feel live. What I think of are moving from town to town nobles in brougham with some guards, traveling knights with a pair of squires and so on. If you kill everyone in a caravan, would your rep decrease or remain unchanged because there was no witnesses?